Dutch architecture firm UNStudio has designed a skyscraper for Singapore that looks like a cactus. 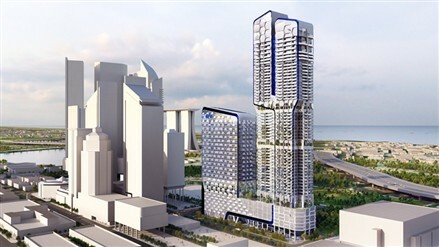 Located within Singapore's business district, the V on Shenton building for property developers UIC will replace an existing tower block that has housed the company since the 1970s. The building will comprise a 23-storey office tower that matches the height of surrounding buildings, as well as a 53-storey residential tower that rises above. The high-performance facade is composed of hexagonal panels that create a hive-like pattern and work to minimize heat gain while providing an abundance of natural daylighting. Lush sky gardens will bisect the tower the three places and create a refuge from the city while cleaning the air.